Greenleaf Book Group, 9781626340817, 249pp. Since his documentary, Fat, Sick & Nearly Dead, was released in 2010 and became a worldwide sensation, Joe Cross has become a tireless advocate for the power of juicing. The Reboot with Joe Juice Diet brings us of the plan that allowed him to overcome obesity, poor health, and bad habits, and presents success stories from others whose lives he's touched. Joe--who managed to lose one hundred pounds and discontinue all his medication by following his own plan--walks you through his life before juicing, sharing his self-defeating attitude toward food and fitness, and brings you along on his journey from obesity and disease to fitness, a clean bill of health, and the clarity of physical wellness. 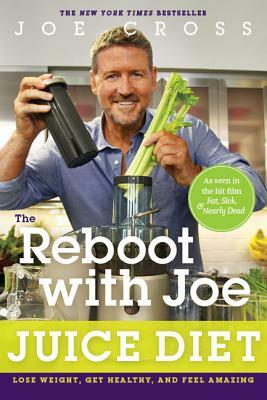 In addition to sharing Joe's inspirational story, The Reboot with Joe Juice Diet gives readers all the tools they need to embark on their own journey to health and wellness, including inspiration and encouragement, recipes, and diet plans. Joe Cross is an Australian filmmaker and entrepreneur whose personal journey of transformation was chronicled in the award-winning documentary "Fat, Sick & Nearly Dead," which to date has been viewed by more than ten million people around the world. Joe's journey to reclaiming his health and vitality through a 60-day program of consuming nothing but the fresh juice of fruits and vegetables--"liquid sunshine," as he calls it--inspired millions of people to follow his example. Joe created Reboot with Joe (www.rebootwithjoe.com) to provide information and tools to a global community of people eager to "Reboot" their lives. This book is Joe's complete, easy-to-follow plan, which includes advice, tips, and insights into the emotional and physical effects of a Reboot. Joe lives between New York, New York, and Sydney, Australia. His next documentary will be released in 2014.